No, I'm not dead. I'm not sure what happened; it's kind of a blur. I seem to recall humid days with appointments, errands, and meetings at work. I seemed to find myself at stoplights having an epiphanies about political power struggles, love, relationships, and big mistakes. Many a morning the alarm would go off and I would just stare at the ceiling and wonder why I have to get up today. If it wasn't for Dizzy I would of got fired last week. He knows the schedule and he's quite persistant. I watched the democratic convention with a heavy heart and a six of Sam Adams. This morning I was driving in the country and spyed two horses running with six goats. They were playing around and it just melted my bad mood away. Tonight the girls are coming to town. Only tough gals from Detroit can rock my world tonight. Broadzilla is playing three blocks away and I might just dance my way home. It's time to boil all my stress away. Wish me well. Last night I thought my house was being bombed. Around 2 a.m., a monster storm dumped so much rain down that the sewers clogged with garbage and it flooded High Street. The thunder and lightening was so bad that I crawled out of my bed and slept in the hallway. At lunchtime I ate a tuna sandwich in my car and listened to the 911 Commission findings. My heart sank. Their findings didn't jive with Richard Clarke's testimony (under oath). The Saudi's were basically cleared. I have a hard time believing all those different air traffic controllers screwed up. Too bad their interviews were destroyed (like Bush's military records). I haven't read it all yet, but I smell a rat. It's written like a cheap thriller and doesn't answer key questions. Get it here and go down the rabbit hole with me. I guess this one goes on the shelf with the Warren Report with it's magic bullets. Before you take the plunge, let's go back in time. Thanks to the BBC archives. A busy day without a care in May 2000. Anyone who remembers saying "No war for Monica" or "wag the dog", make your hand into a fist and punch your face. Mp3 Blogs are a blast if you thrive on new music. When I first asked about the internet, someone told me it was like the wild west. Watch it evolve. Here's my latest top eight, starting with Lawrence Welk remixed. Eight is enough. Some people visit here for my insights and opinions. Some take advantage of my radio links and having all the cool mp3 blogs in one place (to your right). But the ladies all love the Dizzy pics. I bet if I had a Dizzy pic of the day, I'd triple my hits. He would become the web's Morris the Cat and there would be no living with him then. I wouldn't want to blog if it were all about the cat. If I were to name this picture, it might be "Cat Cleaning Fiercely", but I won't. I drove around listening to old Aerosmith today. It put me in a weird mood. A part of me was transported back to grade school, the other part of me realized that I'm an adult. Aerosmith was my first concert and when you are a kid seeing a rock band for the first time, the guys in that band were godz. Owning a car, buying beer, and staying out late to see bands was what I wanted to do at fourteen. Wish I could get that excited about that now. I also realized like I Aerosmith when they were young and wasted all the time. That's the case with many bands, isn't it? Tonight I going to see The Diverters, Shesus, and Mt. Cyanide in their prime. It's a steamy summer's night and I'm not going to waste it. I can only hope I can find a friend who isn't going to watch cable tv all night. I needed to get rid of things at my place, to make room for all the new stuff I bought. 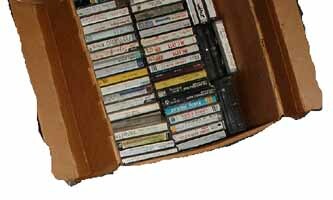 I had to come to terms with boxes of cassette tapes that I spent a lot of time making. I asked myself if I had listened to any off them in the last five years. The answer was no. I picked out a few gems and the rest are in the dumpster. Seems like an end of an era. PS. Kenny, you owe me $20. When Dazed and Confused came out, people told me it was hilarious. When I finally caught it, this film seemed like a documentary of my senior year in high school. A thousand years from now, if an alien race wants to know what life was like in my small town when I was in high school, they would only have to witness Freaks and Geeks. From my crush on a ultra happy preppy gal, to the after school brawls, to the obsession with rock drummers, it is all represented here. I just watched an episode when a kid buys a horrid disco suit at the foe Chess King starring Joel Hodgson ( from Mystery Science Theater 3000) and that Jason Schwartzman ( the hero from Rushmore). These guys also created the much loved/short run Undeclared, which mirrored my undeclared and incomplete college experience. I used to be asked what my major was and would have to say "general". Couldn't settle on English, History, Art History, or Photography, because I was afriad I would never get a decent job with those majors. I just knew Math was the leading source of poverty in my crowd. 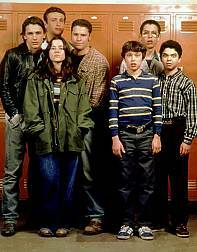 Watching Freaks & Geeks was a revelation on how good a TV show can be. If anyone wanted to figure me out, this would answer many questions. One might even "get" me. The Fourth of July came and went. I watched Tim Burton's Big Fish with my mom and ate watermelon. This was the first time she watched a DVD and she was very impressed. I get the feeling I'm wasting the summer. Not having enough fun and not seeing the world, in a nutshell. I thought I'd write a song in one of my favorite haunts. In the next booth there was a very pretty girl and her friend. The pretty girl listened to her friend go on and on about her relationships. I wondered if I could steal dialogue from this and use it as lyrics. On her boyfriend: "he's little boy cute"
On Friday night: " Afterwards I brushed my teeth 5 times." On life: "Everyone's rolling around in their garbage, until they figure out how to walk away. My goal is to have no limits on what I can own. I play to win and I get what I want. If I get married and I'm not treated like a queen, I'll walk and drain his bank account." That is one scary song. When I arrived home I tried to go to my web site and it was gone. Three days later, no one's got back to me yet. I fear I've been maliciously hacked. This must be The Magic Beans curse at work. It usually takes the form of static on demos, electrical problems at gigs, apathy among musicians, and broken promises. It appears now it sunk my site. When will it end? I would usually say, "to find out more on the Curse of the Magic Beans, visit our web site." Of course now, there would be no point, because it sank into oblivion.